To find out about the current weather conditions in Malpensa and to obtain a forecast for the next five or ten days click here. Milan is the main city of northern Italy standing on the plains of Lombardy with over 9.4 million inhabitants in the city alone. Located in Northern Italy the climate in changes dramatically throughout the year with a winter temperature which can drop below freezing: while in the summer the temperatures can soar to over 32ºC. Milan’s climate is sub-continental with an average daily winter temperature of around 6ºC (44F), occasionally reaching -5/-10ºC (23/14F). During summer, the maximum temperature averages 28ºC (83ºF) and can soar up to 35/37ºC (100-104ºF) with quite frequent thunderstorms. Although the climate is variable and influenced by the nearby Alps and warm winds sweeping in from North Africa, the humidity remains high all year round and annual rainfall averages 1000 mm (40 in). In the winter months the humidity can bring dampness and fog. At the other extreme, Milan has about 40 cm (15 in) of snow each year. Most people visit Italy between June and August, but in our opinion the best time to visit is in the Spring (April-May) and Autumn (September-October) when the weather is good and there are less tourists around. One of the best ways of exploring Milan and visiting unspoilt areas off the beaten track (which are not overrun by tourists) is to hire a car at Malpensa Airport. If you are in Italy during the hot and humid summer months then you should certainly consider hiring a vehicle with air conditioning. 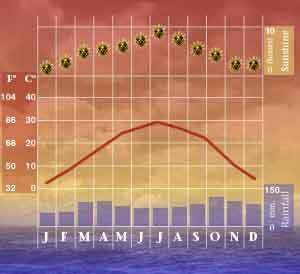 Below is a climate chart showing the average weather in Milan on a month by month basis.